Twenty thousand years ago, at the dawn of the Ice Age, three completely mismatched creatures have been brought together by a twist of fate. Sid, a fast talking and comical sloth, Manfred, a moody wooly mammoth and Diego, a sinister saber tooth tiger reluctantly team up to help return a human baby to his father. Before their incredible journey ends, this unlikely trio will confront boiling lava pits, escape treacherous ice tunnels and meet a prehistoric squirrel rat named Scrat who is frantically trying to bury his beloved acorn. 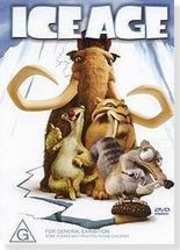 Join the weirdest herd in history for the coolest adventure of all time – ICE AGE! Featurette: "Gone Nutty: Scrat’s Missing Adventure"
HBO Special: "Behind The Scenes Of Ice Age"
A truly funny (an occasionally very sentimental, too) movie. While we`ve had quite a few CG movies lately, this one clearly stands out as being the funniest. The video transfer is superb. There are no compression signs and the CG is outstanding (with the exception of the humans, which are animated pretty badly). The sequences involving water and ice flakes are nothing short of amazing and they simply ooze of detail. The DD 5.1 soundtrack is great. The surrounds are constantly used and give a very enveloping sound (yet not too overwhelming). The characters` voices are spot on. The menus are very nicely animated with sound. The extras include a commentary by the director, an extensive behind the scenes look, a short animated movie, multiple angles scenes, 6 deleted scenes, a picture gallery and a multi-lingual clip. For a single disc edition, the extras are quite impressive. Bottom line - a very funny and well done CG movie that ought to be in each and every one`s collection.